Go ahead and mock us Southerners for shutting down over the 6 or so inches of snow that fell here on Saturday. We’re happy to take a sabbath, close up, hunker down, tuck ourselves in and enjoy a pleasant winter day snugged up in our house, baking, reading, and napping. 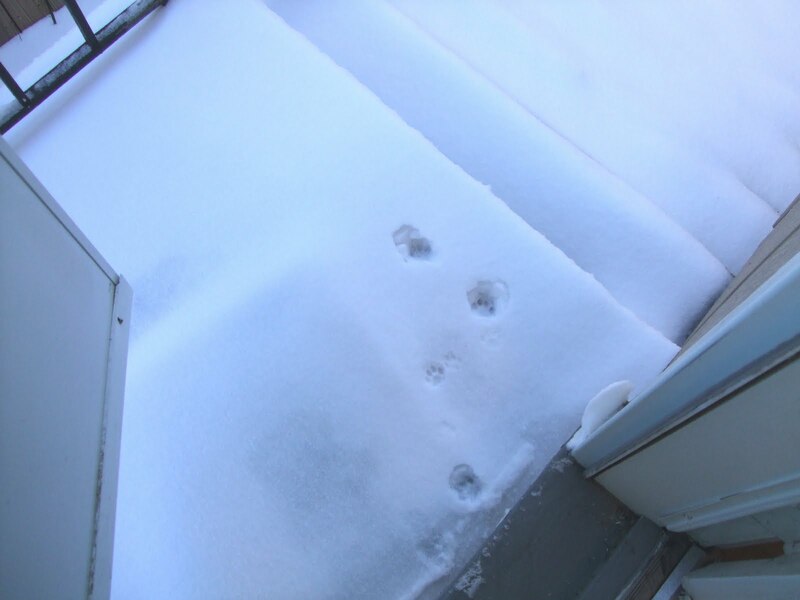 Cleo, never satisfied just to stay safe in a warm house, mewed so desperately to get out on Saturday that I decided to let her venture forth. Obviously, she didn’t get far. And anyway, I don’t understand why anyone would have wanted to leave the house this weekend. I baked like crazy, including this loaf of bread. The recipe claims that this is the “best bread in the world.” That depends on what you like in a bread, of course. 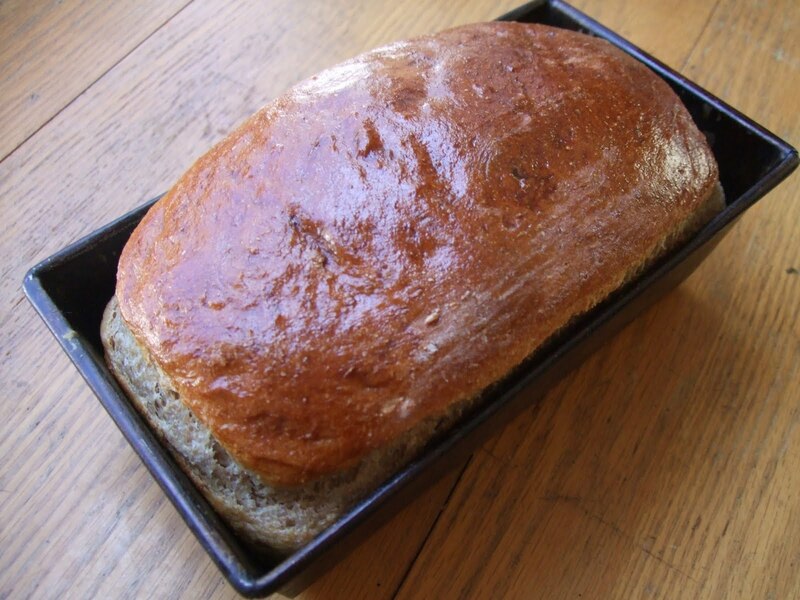 If you like a crusty loaf this one won’t satisfy, but its soft and tender crust makes it perfect for sandwiches. I find its sweet and nutty flavor very appealing. The recipe is quite forgiving in the portion of wheat to white flour. In fact, I accidentally reversed the portion of white and wheat flour in the original recipe, and I like the change so much I kept it here. Pour boiling water over oats in large bowl. Add salt, honey, and butter, and stir. Let stand until softened, butter has melted, and mixture is lukewarm. Stir yeast into lukewarm water and let it dissolve. (I usually give it a stir until the lumps are gone.) Add to oat mixture. Gradually add flour, stirring with wooden spoon, until a soft ball of dough forms. It should stay together easily when you gather it together with your hands. Generously flour kneading surface with white flour. I like to use a non-fuzzy cotton towel, like the ones made from flour sacks. Knead dough until smooth and elastic. The instructions say to do this for 10 minutes but it never seems to take me this long. Dough will be ready when it doesn’t “fold” over easily during the kneading process and it springs back in your hands. Don’t clean kneading surface unless required for another task–you will use it one more time. Oil a large bowl and add dough, turning it to coat with oil on all sides. Cover with a towel and let rise for 1 hour or until doubled in size. Oil 2 loaf pans. Punch down dough and divide in two. Knead each half briefly and shape into loaves. (You can clean your kneading surface now!) Place loafs in pans. Cover and let rise until pans are full. Preheat oven to 350. Beat egg yolk lightly with the teaspoon of water. Brush surface of each loaf with egg mixture. Bake 35 or 40 minutes. Turn loaves onto rack and let cool slightly, if you can resist, before slicing. Loaves will freeze well. This entry was posted in Breads and Grains, Kitties. Bookmark the permalink. what in life is better than having a bread turn out! Yikes! Sorry about the yeast. It's 2 tablespoons–I'll make the correction.